Polls in local swing districts show tight races. Also, with a conservative PAC dropping millions in ads in most of these districts, they will remain close up to the election. Thus, GOTV and other key campaigning remains vital in order to win in November. An IMGE-Insights poll shows Katie Hill and Knight even, with both at 47%. Gil Cisneros trails Kim by two percentage points, 43% to 45% in a DCCC poll. A Global Strategy Group poll shows Katie Porter at 44% and Walters at 45%. Harley Rouda leads Rohrabacher by four percentage points in a Monmouth University poll. Mike Levin behind by three percentage points to Harkey in this Public Opinion Strategies poll. 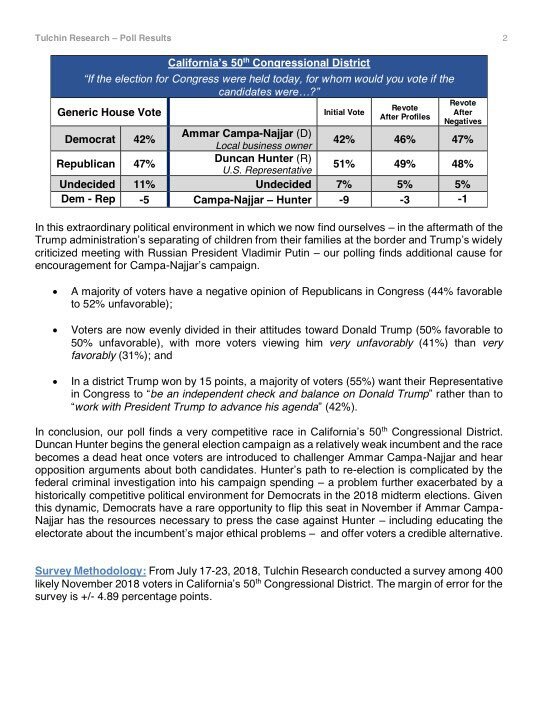 Ammar Campa-Najjar behind to Hunter 51% to 42% in this Tulchin Research poll. Everyone’s help is needed to win these seats. Check out events to join on the Swing SoCal Left calendar. Let’s defeat Republicans on November 6th!